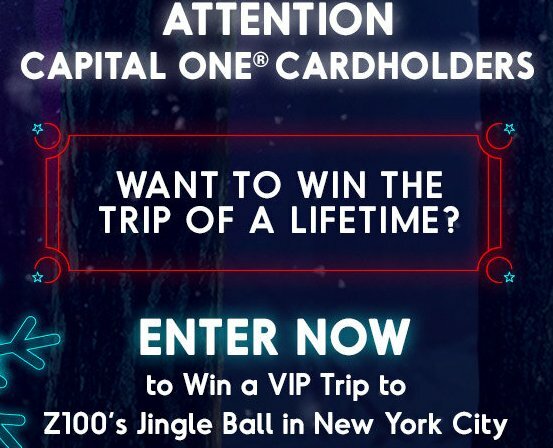 Grand Prize: A $4,000.00 2-night trip for 2 to NY from December 7-9; 2 tickets to Z100's Jingle Ball Presented by Capital One; 2 tickets to the All Access Lounge concert at the Hammerstein Ballroom; opportunity to announce an artist on-stage at the Main-Show; a style preparation session for winner & guest before the Concert; and a meet & greet with a Jingle Ball artist TBD by sponsor. 2-night trip for 2 to NY from December 7-9; 2 tickets to Z100's Jingle Ball Presented by Capital One; 2 tickets to the All Access Lounge concert at the Hammerstein Ballroom; opportunity to announce an artist on-stage at the Main-Show; a style preparation session for winner & guest before the Concert; and a meet & greet with a Jingle Ball artist TBD by sponsor. Must be a Capital One cardholder.